Centrally located near downtown Minneapolis, the city of St. Louis Park offers accessibility to all types of amenities. More than 40 parks, including two large dog parks, are available for residents to use and enjoy. St. Louis Park is filled with historical charm on every block, one of the main reasons more than 40,000 residents call it home. 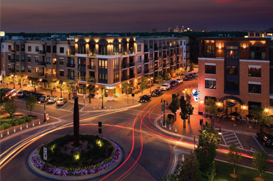 St. Louis Park has a vast amount of different neighborhoods to choose from. With a large portion of the city dedicated to parks, almost every neighborhood features a near by park or lake. St. Louis Park home prices vary with the estimated median house value of $234,391 in 2009. Premier neighborhoods include Cobblecrest, Fern Hill, and Lake Forest. More affordable communities include Aquila, Lenox, Oak Hill, South Oak Hill. You will find a variety of house styles in St. Louis Park, from Ranch style ramblers to classic Cape Cod homes. The city of St. Louis Park is immediately west of Minneapolis with approximately 10.86 square miles and a population of 45,250 people. The city has 51 parks, 24 miles of walking trails, and 3 regional bike trails for the community to enjoy. This first-ring suburb includes a perfect combination of village feel and city accommodations. St. Louis Park has always maintained a successful economy due to its central location within the Twin Cities. Direct accessibility to major highways including I-394 and US-169 has made the city an ideal spot for shipping and transporting for many businesses. St. Louis Park also conducts several city events throughout the year including outdoor summer concerts, which brings many visitors to the happening area. Originally, St. Louis Park was established as Elmwood, which is now a neighborhood within the city. In 1886, the village of St. Louis Park was incorporated and saw immediate growth. The growing village was given its name from the Minneapolis/St. Louis Railway that crossed through the area. After World War II, St. Louis Park experienced a suburban boom. About 60% of the homes were built in a single burst from the late 40s to the early 50s. As the residential developments grew, the need for commercial developers was at high demand. Shopping centers, including Knollwood Mall (which is still present today) became one of St. Louis Park’s main attractions. It wasn’t long until this prosperous village reached the status of a city, therefore in 1954, the Village of St. Louis Park officially became the City of St. Louis Park. The city of St. Louis Park is primarily served by St. Louis Park Public School District 283. The district includes four K-5 elementary schools (Aquila Elementary, Park Spanish Immersion, Peter Hobart Elementary, and Susan Lindgren Elementary), one grades 6-8 middle school (St. Louis Park Middle School), and one grades 9-12 high school (St. Louis Park High School). Each school is proud of their strong ties to the community from their shared city and school district boundaries – uncommon in most suburbs. St. Louis Park is directly west of Minneapolis and can be reached through several highways. Interstate- 394 borders the northern side of St. Louis Park with highway 100 going through the eastern part of the city and highway.